Camps Bay Retreat and the beauty that surrounds it has a way of creeping into your soul. The stunning Retreat has been one of Cape Town’s most beautiful properties for decades, and it’s easy to see why the Retreat welcomes so many return guests through its doors. Among these returning guests are Mr Haye and Mr Perechtel – two old friends who visit Camps Bay Retreat every Saturday for a game of tennis and a friendly catch up. The two gentlemen have been visiting the Retreat religiously for decades. Speaking to Mr Haye and Mr Perechtel, it’s easy to see that these two firneds have a special place in their heart for tennis – and even more so, tennis at the Retreat. Despite their age (both gentlemen are in their golden years – not that that stops them!) Mr Haye and mr Perechtel would rarely miss a game, come rain or shine! 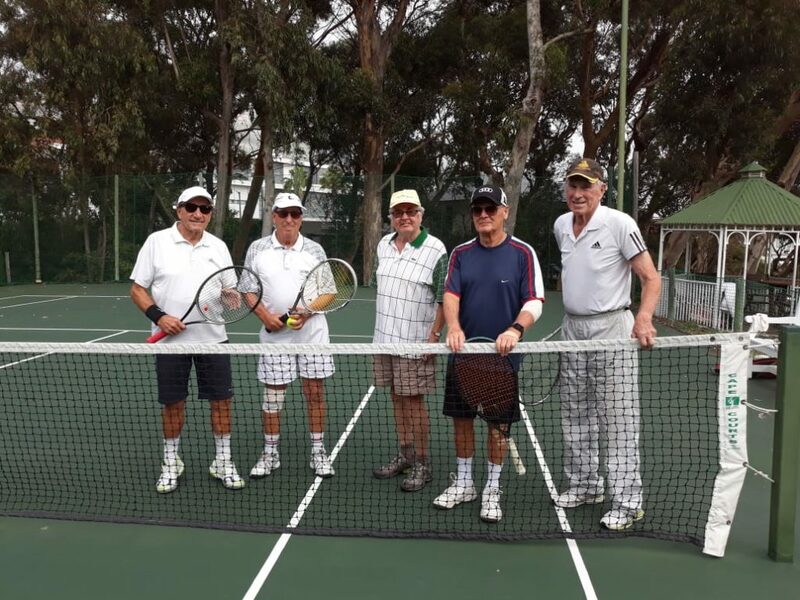 We recently caught up with the two gentlemen after their game – whilst enjoying an ice cold Windhoek, as is tradition – to find out a little more about their interesting lives and how it came about that they have enjoyed the tennis court of the Retreat for so many years. Born and raised in Windhoek, Mr Haye was raised on a farm with no electricity. This clearly influenced his chosen career, as he later moved to Germany where he started a small business as a middleman selling electricity to ships. Mr Haye (now at the ripe old age of 84!) enjoys spending most of his time with his friends, and his two children, Mr Haye’s son lives in Hout Bay, and he also manages to take an occasional trip to Munich, where his daughter lives. Mr Haye enjoys the exercise playing tennis affords him, and believes in continuous exercise. It all started in 1945, in Windhoek at the St George’s Anglican Church School, when one of the pupil’s mothers decided to give tennis lessons after school. How long have you been playing tennis at Camps Bay Retreat? Well, a very long time… from around 1963, so that makes it over 50 years now! How did your arrangement with the owners of Camps Bay Retreat come about? I was first introduced to the family who owned the Retreat through my secretary’s niece at the time, and we started playing tennis together occasionally. From there one, it just never ended. Besides the fact that the Retreat changed ownership, Mr Haye still enjoys his game of tennis at Camps Bay Retreat, and he says that he feel honoured that current owner, Maree Brink, still allows him and his friends to continue with their Saturday tradition. What do you enjoy most about playing tennis at Camps Bay Retreat? Oh, definitely the surroundings and the type of tennis court and the fact that it is well maintained! We believe you play tennis come rain or shine – is this true? Aah, yes – we play in any weather! We enjoy it because we can exercise while we enjoy each other’s company. Mr Perechtel may have two years on Mr Haye in terms of age, but they still give each other a run for their money on the tennis court. Mr Perechtel was born and raised in Germany and now lives in Munich. He is retired, and had a career as a Pathology Professor. Now, at the age of 82 (the ‘young one’ as Mr Haye calls him!) he enjoys travelling to Cape Town, and stays in his son’s house in Hout Bay. Mr Perechtel says he was introduced to Mr Haye through their daughters, who were close friends at the time and still keep in touch with each other. Mr Perechtel says that he originally just looked for someone to play tennis with, but soons became very good friends with Mr Haye and the other people they play tennis with. It will be roughly 45 years now. I only started playing tennis at a later stage as a means of exercise. I started playing tennis in about 1974. For almost 10 years now, even though it does feel like yesterday still when I started playing here! But you know what they say – time really does fly when you’re having fun! Well, it was mostly because I became friends with Mr Haye and so the friendships and socializing started every time I would come for a visit to Cape Town. Definitely the surroundings and the view! I would say that it is definitely the best court in Cape Town. If I am here, yes then I do. It does depend on how hard it rains, because one can’t play if the court is too wet, but generally we’ll play any chance we get! Mr Haye and Mr Perechtel play with other friends of theirs every Saturday, and are very grateful and happy to continue their lovely Saturday tradition at Camps Bay Retreat.